Fabulous fun in an amazing Easter Wonderland. 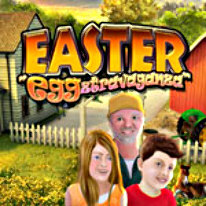 Play captivating mini games such as spot-the-difference, jigsaw puzzles and many more in Easter Eggztravaganza. Join Mike and Sally as they go have some Easter fun. Follow them to get fresh laid eggs from the farm to paint them. Then head over to their Aunt Janet's house and the shopping mall. There are tons of eggzellent fun to be had everywhere they go. Don't forget the yearly Mega Easter Egg Hunt. A fantastic Easter adventure awaits you!